You can use up to 30 hashtags on an Instagram post. But, many marketers say that looks spammy. Use 5 or 6. Others say using 11 gets you the best engagement. Well, no. The study they’re referring to found that posts with 11 or more hashtags get the best engagement. I’m a fan of using all 30 hashtags. Do people find it spammy? My engagement rates say otherwise. Using 11 or more hashtags means 442% more engagement that using none, and about double engagement over using 1 – 10. So yes, use at least 11, and more if you want to grow your account. Is there a maximum of hashtags on Instagram? The maximum allowed Instagram hashtags is 30. I recommend you use them all – unless you’re happy with your follower number and engagement. Want to grow? Use 30 hashtags! What’s the hack to use 60 hashtags on Instagram? There used to be a trick where you could first post 30 hashtags in a comment, then go back and edit the photo caption to add 30 more hashtags. Instagram didn’t recognize the hashtags in the caption edit. They caught on in 2018, though. So the maximum is 30 Instagram hashtags in 2019. Should I post Instagram hashtags in comments or caption? 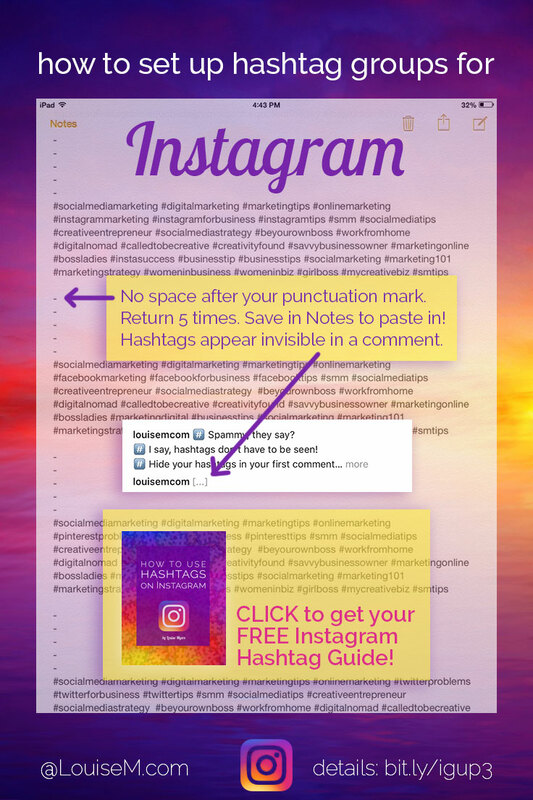 Instagram hashtags may be placed in the photo or video caption when you post it. 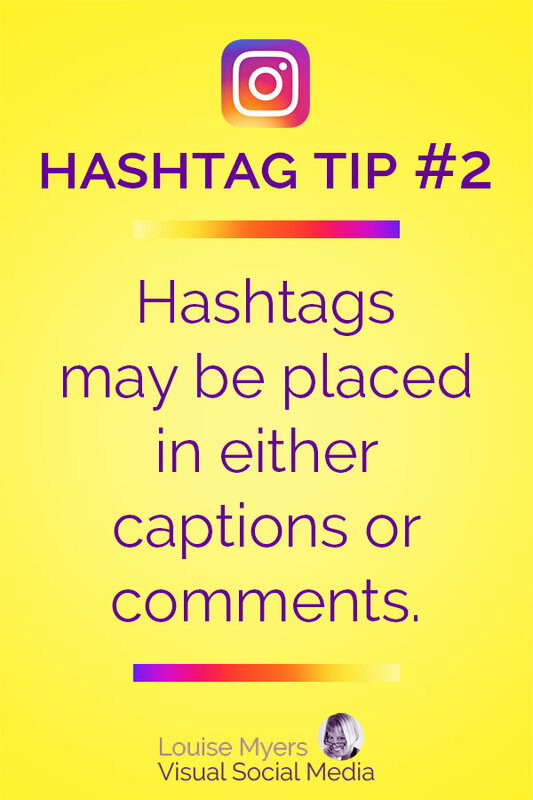 Or, hashtags may be added in a comment (or several comments) after posting. There’s no difference to their functionality, so it’s your choice. I prefer adding hashtags in comments, as these are quickly buried once you get a few user comments. As of 2018, the caption is cut off after 2 short lines of text, so caption hashtags don’t show at first glance either. However, the “More” tag will open the full caption. If you’ve written an engaging caption with a call-to-action or question (please do! ), people may get distracted by a raft of hashtags and forget to complete your desired action. This is why I recommend Instagram hashtags in comments rather than captions. You can hide those 30 hashtags, so they can’t look spammy! Make them invisible by preceding them with five dashes or periods, each one on a line by itself. NO space after the period or it won’t work. If you post this in your first comment, IGers will just see […] after your name in the photo stream. (Tested 1/11/2019 – it still works. The hashtags are only invisible in the photo stream! If someone clicks to read comments, they will see the hashtags). Create your hashtag text file as I show below, in your phone’s Notes app, because there’s no return key when posting a comment in Instagram. NOTE: If you’re having problems with this trick, it’s almost always because you have a space at the end of your line. It’s a bizarre and annoying quirk, but Instagram will take out the return if there’s a space at the end of the preceding line. Can I add hashtags to someone else’s Instagram photo? No. You can’t add working hashtags by commenting on any other account than the one you’re signed into. IGers may comment with hashtags, but the other IGer’s post won’t appear in that hashtag feed. You may see people leaving hashtag comments on others’ posts. Often, the commenter is suggesting that the original poster add that hashtag. A little helpful advice, perhaps. Or, they may not know. But generally I see this between groups of IG friends who are helping each other get featured on Instagram hub accounts. Should I use popular Instagram hashtags? If you’re using 30 hashtags, okay, go ahead and make 1 or 2 of those popular ones. This will get you some quick likes. However, most of those will be fake, bot likes. Yes, automated “bot” activity is still a problem on Instagram in 2019. Use popular tags, and you’ll likely also be the target of annoying follow-unfollow activity. This is where those rule-breaking IGers use automation to follow accounts they think might follow them back. If you don’t, or maybe even if you do, they’ll unfollow you anyway. Don’t take it personally, as it’s all automated. No one is making any judgement of your account. Please don’t ever do this. You risk your account being shadowbanned or even closed. But back to those popular tags, they may work for likes in the first second after you post. Your post will be quickly buried in the hashtag feed. 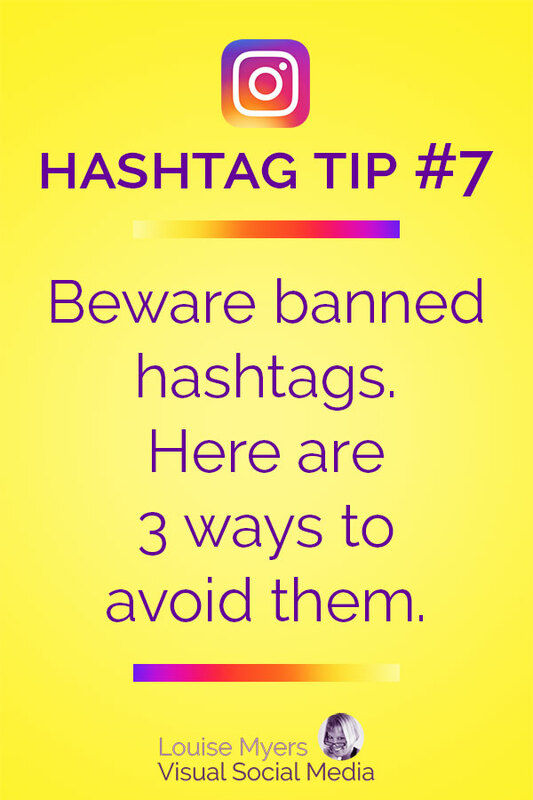 In addition, popular hashtags are often used by spammers and quickly get banned! Using banned hashtags may put you in league with spammers and arouse Instagram’s suspicions about your account. So now you want to know: which hashtags are banned by Instagram? … the hashtag #happythanksgiving was completely overrun with spam, so they banned it. From here on out, if you use the hashtag #happythanksgiving, not only will your content most likely not show up for that hashtag, you might also be flagged for spam. 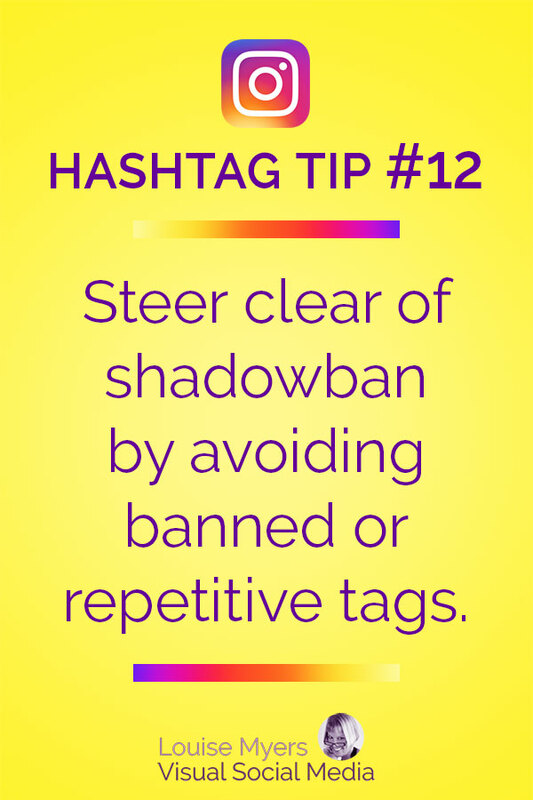 The repetitive use of banned hashtags, leading to multiple flags to your account, could even result in shadow banning or account removal. Of course, in order to avoid these forbidden hashtags, you have to know which tags are banned. How is anyone supposed to know that #happythanksgiving is considered “spam”? 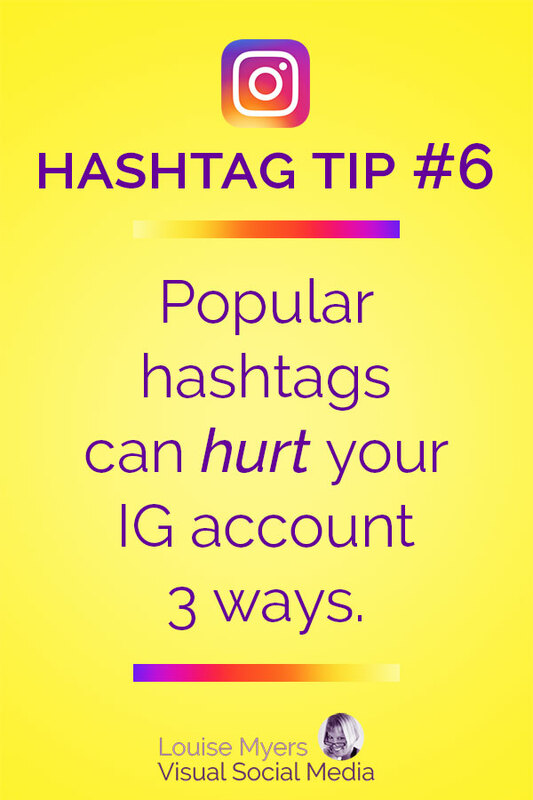 Don’t use any of the most popular Instagram hashtags. Research any hashtag before using it. Use Tailwind Hashtag Finder. NO banned hashtags are ever included. To research currently banned tags, search for a specific hashtag in the search bar. Click on the hashtag and scroll through the pictures. If you reach an end where a message says the posts are “currently hidden,” it’s a banned hashtag. Want to save the hassle of researching banned tags, and find the best assortment of hashtags for your audience? 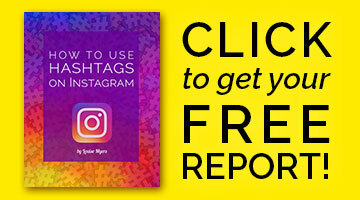 Click to learn more about Tailwind Hashtag Finder for Instagram. Or jump in and try it out! It’s free for 30 Instagram posts. Disclosure: I’m a Tailwind affiliate, which means I may make a referral fee if you sign up. 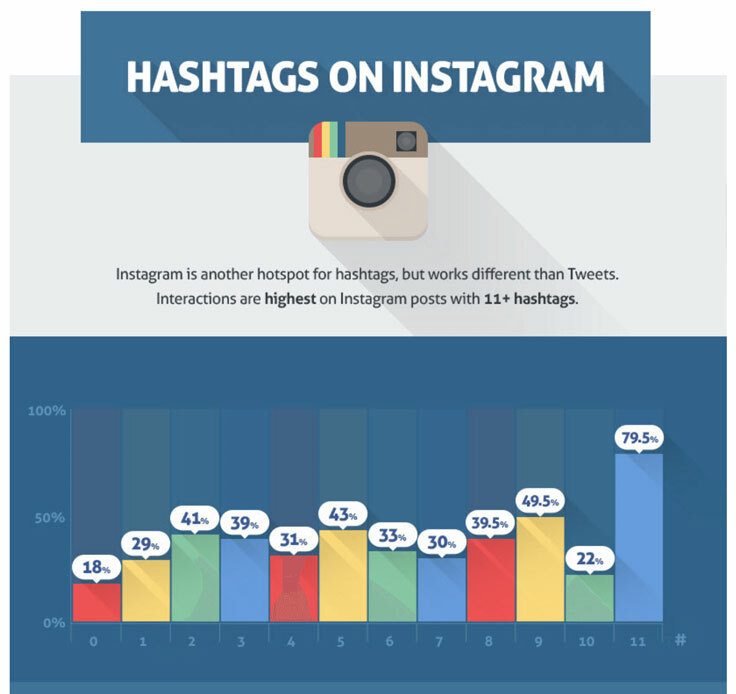 What are the best Instagram hashtags? I don’t recommend popular tags, for the reasons stated above. 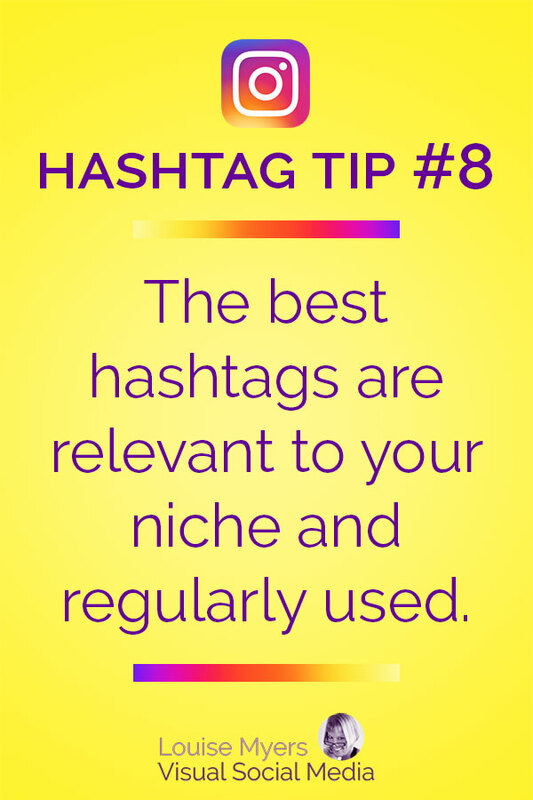 Use more hashtags that are relevant to your niche. Using specific and relevant hashtags helps you connect with people who are looking for exactly what you’re posting. You can find relevant tags by searching your keywords in Instagram, or using a site like Hashtagify.me. Watch what others in your niche are using. See what your peers and influencers are posting on their photos. Check out the related tags Instagram suggests when you tap a tag that’s relevant to your content. Try them if they seem useful! Be sure your hashtags are active. Check the hashtag feed to see that the tags you’re using are currently being used by others. Hint: If you scroll down 20 rows and are still finding content posted in the last few seconds, that tag is too active! Stop using the most popular hashtags like pretty, beautiful, love and similar ones. Your post will be buried in that feed within milliseconds. In researching this, I also discovered a lot of posts in those tags that I don’t even want to be seen with (some I even felt obligated to report). Okay, sprinkle in a few popular hashtags when relevant to your post. Not necessarily the ones with 100M’s of posts, but one or two over 1M might give you some quick likes. Note: Your content really needs to be awesome to stand out in a lighting-fast moving tag feed! Create a custom tag for your brand or campaign. Check that these tags aren’t already being used, particularly in a way you wouldn’t approve of! Prompt fans and followers to use your tag, and you’ll soon learn just who your superfans are. Support, encourage, and regram them! Easily find the best Instagram hashtags! Sign up for a free Tailwind trial. Cost after trial: $9.99 per month, paid annually. Can I add hashtags to Instagram after posting? You posted a bunch with your photo. You came back later, deleted those tags, and added a bunch more. Magically, your post was bumped to the top of those hashtag feeds, regardless of how long it had been since the original post. Your engagement spiked once again. But Instagram changed all that for us in March 2015. No matter when you add a hashtag to your photo or video, it will appear in that hashtag feed with other photos and videos posted at its original posting time. Keep in mind that if you add a hashtag to a photo after it was posted, the photo will still appear on the hashtag page according to the time it was originally posted, not the time the hashtag was added. The short answer is yes, you can add hashtags to your own posts after posting. 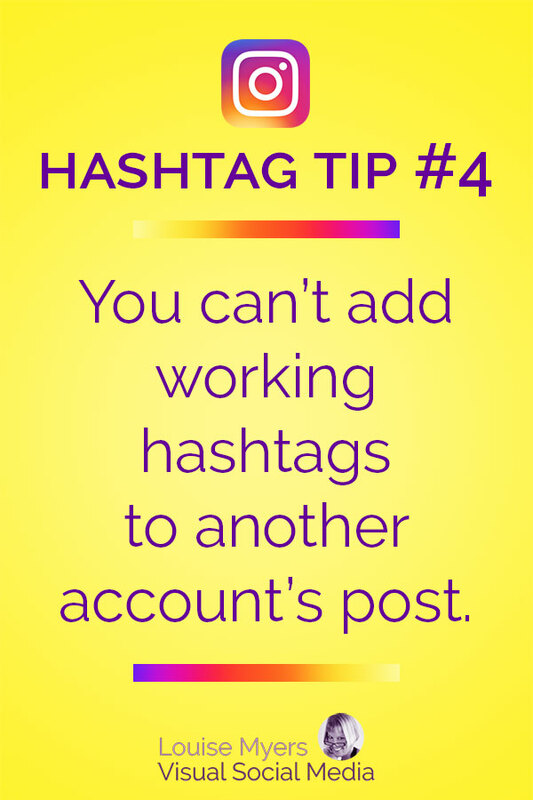 Popular hashtags must be added immediately, or your post will never surface in those feeds. If you like, you can delete those later and add niche hashtags in their place. Personally, I think your time is better spent on creating new Instagram posts. Why are my Instagram hashtags not working? You may be the victim of a shadowban. If you get shadowbanned on Instagram, only you and your current followers will see your post when they search for the hashtags you used. If someone who doesn’t follow your account searches for one of those hashtags, they won’t see your post! This defeats the purpose of using strategic hashtags to grow your Instagram community. Instagram doesn’t admit there is such a thing, by the way, so don’t expect to get help from them. You can use the “Report a Problem” feature in your account settings under “Support.” I no longer get a reply when I do this, but it can’t hurt. Instagram shadowbanning is sometimes a result of spammy behavior. Using “broken” or banned hashtags. Sometimes a normal, everyday hashtag can be banned. Popular tags are often used on content that violates IG community guidelines. Then Instagram might block the hashtag outright, meaning you can’t even search for it on IG, or they’ll limit the posts shown in that hashtag feed. So, you could search each hashtag feed individually for evidence that a tag is broken or banned. Don’t use those! OR, just make your life easier by using Tailwind’s Hashtag Finder! It will give you fresh, related choices so you’re not repeating the same hashtag group, and it will only suggest tags that are Instagram-approved! If you insist on using uber-popular hashtags, you MUST post them in your post caption. If you wait even a second to post them in a comment, they’re pretty much worthless, as your post will be buried in that hashtag feed the instant you add it. If you post hashtags in several comments, post the more popular ones first. Post hashtag comments in the order of how fast the hashtag feeds move! Niche hashtags CAN still be added at a later date! DON’T bother adding hashtags where the original date of your post would have it buried deeply in the feed – BUT there are some cool super-niche hashtags that have only several hundred to a few thousand posts in them. Many of these even have avid fans! For easiest hashtagging, keep groups of 30 hashtags in your phone’s Notes app. Create and save a set of 30 tags for each type of post you make (or less than 30 if you insist 😉 ). Copy your hashtag group before you make your IG post! Then you have them ready on your clipboard to add in a comment immediately. No fumbling, no wasting valuable seconds. Or, set up a text shortcut! Conclusion: Do This for Instagram hashtag success! 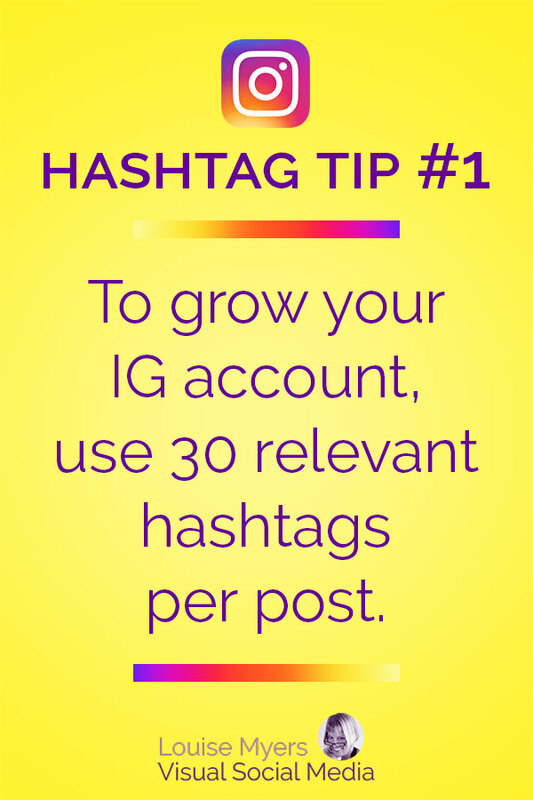 Use 11 to 30 hashtags to grow your account. Hide your hashtags in a comment with . and return, 5 times. 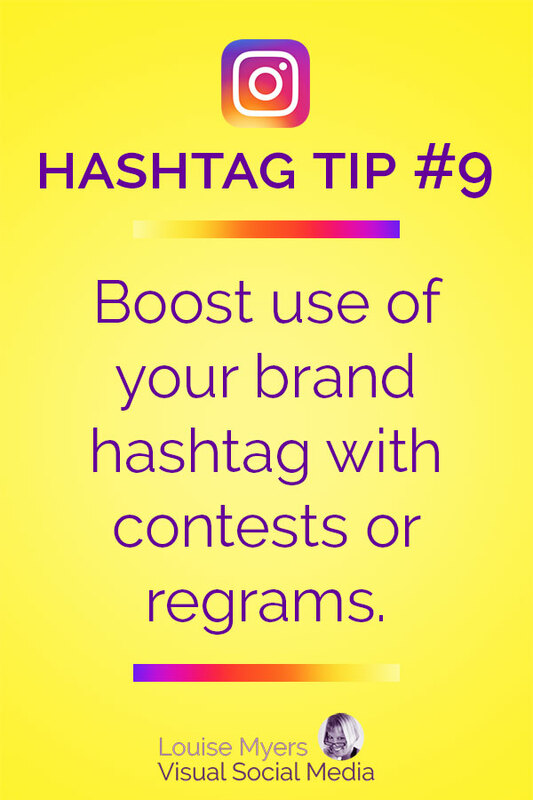 Use more hashtags relevant to your niche. What does Instagram suggest as related? Use only a few popular hashtags. Only use tags relevant to your content. Post in the description – don’t wait for the comment. Your content must rock to stand out in popular tag feeds. Choose hashtags that are actively used (but not too active!). Be sure to check first to see if it’s already being used. Promote your tag’s use by followers. Engage / shout out your fans who use it! 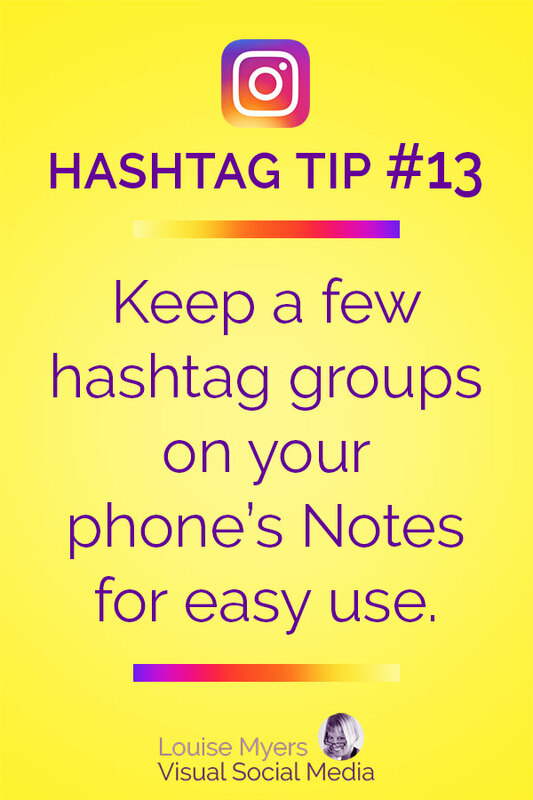 Keep hashtag groups in your phone’s Notes app. One group for each type of content you post. Copy them to your clipboard before you post content. Follow up immediately with hashtags in a comment. 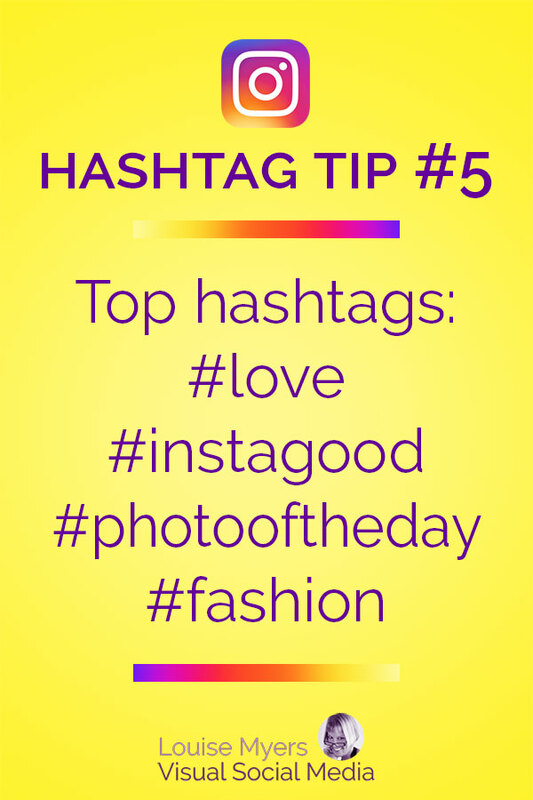 Bonus tip: Your hashtags will magically work much better if you’re posting awesome visuals! People are scanning those hashtag feeds, and you need to stand out. 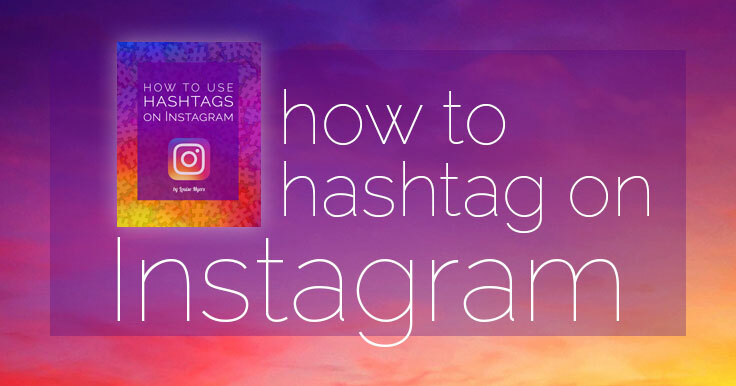 If this post has helped you learn how to use hashtags on Instagram, please share! 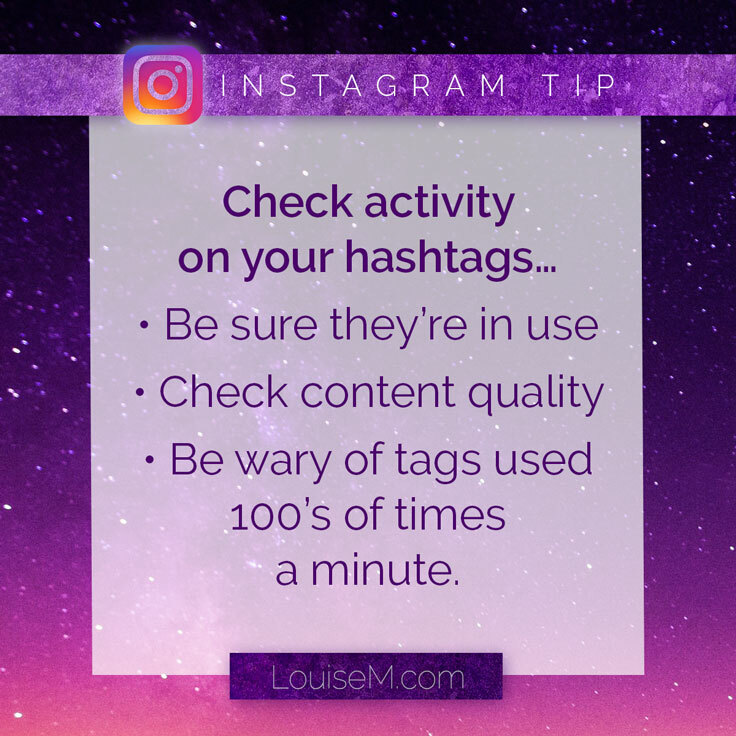 Thanks so much for these tips Louise. I just posted a pic on IG following your hashtag tips and I can already see an increase in Likes. Thanks so much for the post! I’ve been working hard to grow my Instagram and your tips will for sure help! Terrific! Best of luck to you, Abbey. Louise Myers… Thank you. My name is Preston Pittman and I write poetry on Instagram under my name. I’ve been told my poetry is very good, but I can’t figure out how to reach more people. Is there something I might do using more or different hashtags? ? Yes! More hashtags. I use 30. Also I’ll be publishing an update of this post on Monday with more specific tips, so come back and check it out! Planning to create a free download too. Not good at all, Now my old photos can’t participate in new contests or I have to re post them again! I know, Albert, this is making it very hard on hubs and the IGers who participate in them! If you jump on a NEW contest hashtag with an old photo, you have a chance of being noticed. Otherwise, as you know, your image will be buried. It’s terrible isn’t it, Massimo? Sorry, I don’t have any other tips. If you find any, let me know! For the last few weeks I’ve been thinking Instagram had somehow restricted my hashtag usage as I was unable to see my entries for #JJ daily competitions using old photos. I know what you mean, Gary. I’ve still been able to garner some features via old photos, but I don’t take part in the jj hub. Very nice gallery – best of luck! You’re welcome, Lesley, thanks for taking the time to comment! Thanks so much! Makes perfect sense! I’m happy you liked it, Lara! Thank you for this!! It’s exactly what I was searching for. I’ve been adding old hashtags still with no adding movement on followers and now I know why 😉 thanks again!! You’re welcome Mandi! Glad it helped. 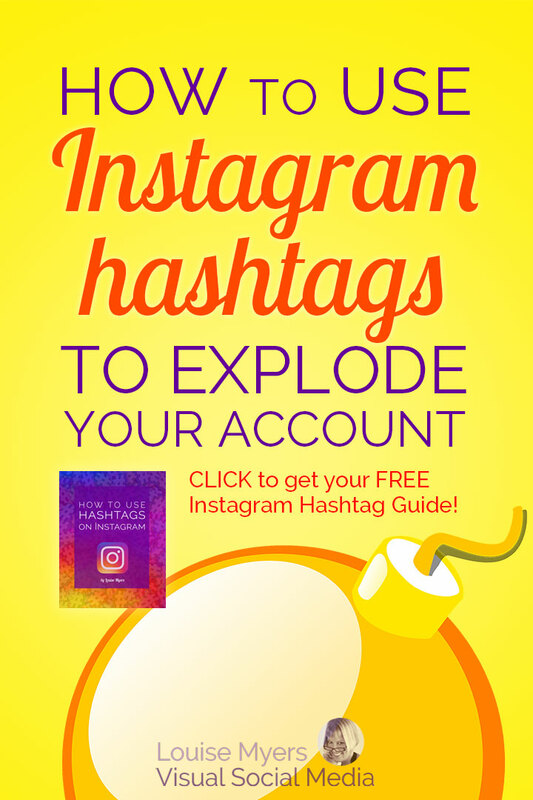 Good article and very easy to understand for How to Use Hashtags on instagram … and I also discussed the article about the guidelines and how to have an account to use the Indonesian Intagram that certainly might help beginners in my country to make instagram account. To see it please click URL above. I’m glad this helped explain, David! Thanks for your comment. Love it! Not the change of course, but great post. Thanks! Glad you found it useful, Prince. You may use idealshare to download edit video. OK. I will just add that doing so may constitute copyright infringement. Where do yo copy hashtags from? How exactly is it done? From a previously posted photo? I am a slow typist and typing 20-40 caption plus hashtags on a small phone will take too much time. Is there any way to write-think-save-edit on a PC and then copy to IG? I keep hashtag groups in my phone’s Notes app, and after posting a photo, copy and paste an appropriate group in a comment. If you have researched tags you like in the Instagram app and then start typing them in a photo comment, they will auto populate for you so you don’t have to type the whole tag. Before you post the comment of hashtags, copy it so you can paste it into your Notes app to use again on a future photo. You can’t copy an already-posted comment in the Instagram app, so you need to save them somewhere you can copy later. Have you noticed recently any differences between cut paste tag use and manually picked / typed ones? I can’t be certain but it seems like there is a drop off in likes recently if you paste tags from Notes as opposed to doing them one by one. Might just be me. Not sure. Not that I’m aware of, Mike. Not sure how Instagram would “know” how the tags are entered? – open email on the phone, copy ALL, paste to Instagram. I need to practice writing hashtags because they are image-specific. I’ll figure out; thank you! That’s a good way to do it. Or you can type them up in a Notes app on your phone and just save them there for future use. On iPhone it’s called “Notes” but I’m sure there’s a similar app on Android. Great article! Everyone is always debating whether or not to put the hashtags in the caption or not so this was helpful. Do you know, is there a way to know which hashtags in a specific post really worked? Meaning, if I got 50 likes on a photo and used 5 hashtags is there a way to determine which of the 5 had to most reach? Also, what have you found to be the best way to measure success on Instagram? Iconosquare? I don’t know of a way to test specific hashtags. Intriguing idea! I’ve used Iconosquare. I’m not big on stats, so I haven’t sought out other possible metrics. It’s easy with Iconosquare to see which content and times are working best for you. Glad you liked the article! Cheers! I recently added hashtags in my comments to some old and new posts by other people. For some reason, the hashtags I add are clickable and take me to the relevant hashtag page, but the actual photos are not added under these hashtags. Also, when I search for these hashtags, these photos (published by others), to which I added the hashtag in my comments, do not come up in the list of results. It is not an issue of using very popular hashtags and the photos being left at the bottom of the pile. Even hashtags with 4-5 photos, still do not show the photos that I added the hashtag to in my comments. Any ideas what’s going on? Can users (with clearly public profiles since I discovered the photos) choose not to accept hashtags by others? It just makes no sense. Hashtags that you add in a comment on others’ posts don’t add the posts to the hashtag feeds. You can only add your own photos. Thank you, I did not know that as I have only recently started using instagram. the problem I have is that I am a furniture designer and many people post photos of my furniture without adding a hashtag that directs to my name or the name of each design. I would like people to be able to search my name hashtag or design hashtag and see photos that others have posted for me or my designs. I thought by adding hashtags to others’ photos would solve this issue. Currently the only way I have to place all these photos in a list/group is to like them which adds all of them to my like list. This is not ideal though for non-followers and for anyone performing hashtag search. Could I just ask people to add specific hashtags to their posts? I would love to liste to your advice on this problem. Yes, it’s a great idea! I’d start by saying something nice, like you’re so happy they like your work. Then say you’d like to add their photo to a gallery of your designs (I think that sounds appealing, don’t you?). Ask if they’d be willing to add your hashtag (name it) to their photo in a comment so it can appear in your gallery. Additionally, it’s generally accepted to repost others’ photos if you give them a “shoutout” (tag their account @username and say something nice. It could be as simple as “Thanks @username for posting this great photo of my Design Name end table!) There are apps that do this too: Repost or Regramm. Then you can add the hashtag to your own post, or just have it in your own profile gallery. So can anyone copy and paste to me watch hashtags to use to get likes? Not sure if I understand your question… if you’re asking if others can add hashtags to your photos, they cannot. Your photo won’t appear in the hashtag feed unless you add the hashtag yourself. Thanks for this article…. I have issue with hashtag. Maybe you could help me figure it out. So, now whenever I post, my picture not showing anywhere on the hashtag search. Maybe sometime yes it shows, but mostly not. Could be IG put new rules on hashtags now? Or the problem is in my account (banned for using hashtags)? I saw everyone pictures are show up on the same hashtag as mine (the same content). I don’t receive any warning from IG if I break the guidelines. If you’re including any hashtags that Instagram has banned, the whole group of hashtags won’t work. 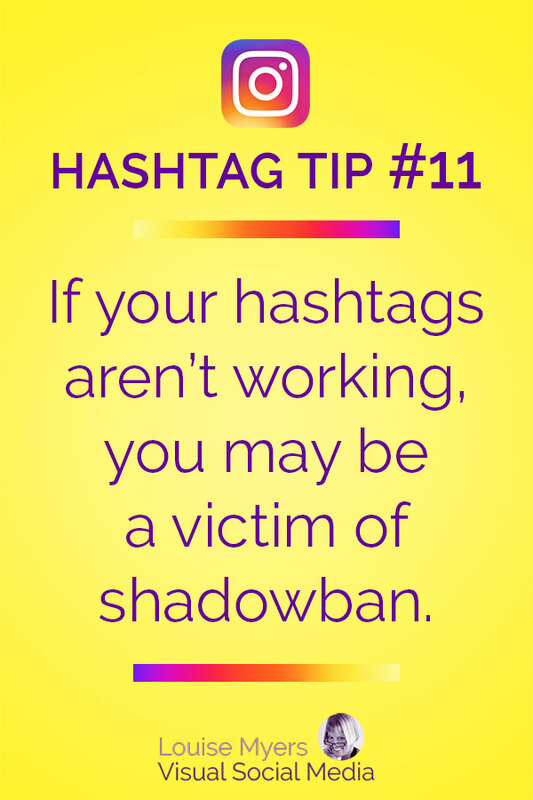 It’s not always obvious which hashtags are banned, and they change often. If you want to read this article, you’ll see that for a time IG was blocking the tag #curvy. I have no idea which tags are banned right now. There use to be a long list including words like #photography and #Instagram! Hi! I was having a similar issue. I was following basically the same guidelines you recommend above with saving hashtags in my notes app that are associated with my jewelry and then pasting it immediately after posting my picture in the comments section. A few days ago I started noticing dramatically less likes and realized that none of my pictures were showing up in the hashtag searches. I tried going through all of my hashtags that I use and couldn’t find any bans on them. I also just tried using one hashtag that was a less popular one, my picture would still not show up. Appreciate any advice you may have!! There are problems with IG right now. Several features aren’t working for some people, but are for others. I think it’s similar to what some call “Facebugs,” when FB changes too many things too fast, and things go wrong. I think I figured it out! This is what worked for me: I deleted both the Instagram and Facebook app and then redownloaded them. Seemed to clear up any bugs. Thanks for your time and I hope this helps others! Disregard that last post 🙁 it removed all my pictures from the hashtags again when I went to post another picture. I guess I posted one too many hashtags? Pretty sure mine were tags that were not banned. I’m not sure what’s going on with Instagram but I really hope they fix this soon! Argh! Can you please help me? I have tried to post one around 27-30 hashtag comment to each of my photos, and all I get when posting is the red exclamation mark error every time I try. I’ve tried everything. I’ve even tested it out by copying multiple successful instagrammers hashtags (they didn’t seem too spammy) to use on my photo, and those won’t post for me either. Please, please help. I’m sorry to hear this. I’ve only heard of one other person who couldn’t post hashtags in a comment. They could in the caption, so you could try that. Or try posting several smaller groups of tags in multiple comments. I’m sorry, I wish I knew more. Please let me know if you figure it out. I’m the writer from above. I post mostly fashion and travel photos and have spent an actual day trying to find a combination that will work for fashion. I was able to get in some travel hashtags on one post a few days ago after eliminating my hashtags from 25 to 13. They aren’t even the hashtags I want. I just saw a post on IG that had 70, yes 70 hashtags, I counted them. Did something change on the number of hashtags allowed ? I personally still think less is more but was just curious. Don’t know how they did that. I’m never able to post more than 30. Did the post actually show up in the hashtag feeds? Do you happen to know about tagging? In one of my photos I want to tag the company that made my boots but the tag does not show up. There are only 19 hashtags so I’m not sure if it’s a hashtag/tag combo or if the other user has to be following you to tag them? I’ve never had a problem tagging accounts that don’t follow me. Not sure what’s going on! IG could be cracking down hard on that as well. This may sound silly. But I put a dozen images up to my account a while back and didn’t hashtag any of them. Should I just delete and re-post them with relevant hashtags? Or, since they never went to a hashtag feed, would they still end up as the date of original post? I have minimum followers and engagement, so I wouldn’t think it would be an issue would it? Yes, if you hashtag the old posts, they will appear in the hashtag feed with other posts from the same time. So most likely, very buried. I’d repost them. Don’t even bother to delete if there are enough posts in between so a visitor to your profile wouldn’t notice the duplication. Or go back to the oldest one, delete and then repost. Do the same the next time you’re ready to post. I wouldn’t delete them all at once. Any advice on how to discover what the trending but still less-popular hashtags might be for any particular niche? You can try the Explore tab in IG to find related tags. They’re ranked by number of tagged photos, which is useful, but that’s not what I’d call “trending.” I’d like to see what’s rising in popularity, not what HAS BEEN the most popular. Not sure of anything that offers that. If you use HootSuite, try the TrendSpottr for Instagram app. I haven’t tried it yet, but it sounds cool. There’s an iPhone app Hashtap that has really good reviews. It’s free, so worth a shot. Would love to hear if you find something that suits your needs. On my Instagram account for my website I used to have 10K people who had used my hashtag and now I only see 625 when looking on the particular hashtag. Is it possible that this has to do with this update? If so is there any way to retrieve all these pictures of all those people who had added the hashtag before to their pictures? I’m hoping this is a bug that they’ll fix soon. 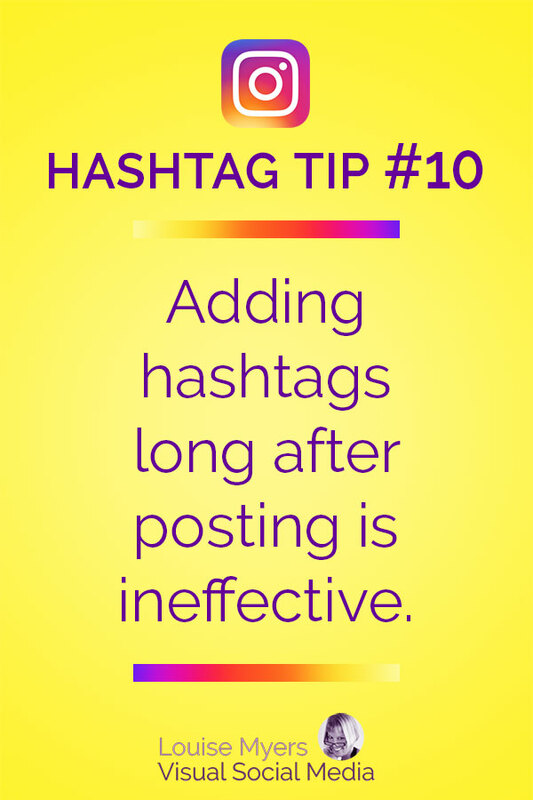 On many hashtags I’ve looked at, it says there are 10 posts regardless of the number (which is dozens or hundreds). I don’t think you can fix the problem yourself, but I’d love to hear if you come up with something! I’m having exactly the same issue – my hashtagged images (for my business account) aren’t showing up in the public feeds. This has been ongoing for me for about 3 weeks now. When I search from the affected account, they are there – but when I search for the same hashtag from any other account (e.g. my personal one), they’re not there. I’ve been reporting it to IG for weeks but still no improvement!! This is a known issue to Instagram now. Apparently they’e been getting hundreds of complaints since Sept. 1. Don’t know why they haven’t been able to fix it! This EXACT same thing is happening to me and has been for the last several weeks and I can’t figure out what to do! I’m not using any banned hashtags and when I look from my business account photos are in the feed but when I look using my personal account my photos aren’t showing up! So frustrating. This is happening to a LOT of people. Unfortunately IG isn’t responding. Everyone sees different photos in the “top posts.” It’s based on an algorithm and is constantly changing. I’m not sure why you’re seeing such a huge dropoff in likes. But the feed isn’t chronological any more, so that’s having an impact (another algorithm). I’ve also suspected that with so many more IG accounts, users’ likes are getting spread around. Both my accounts have dropped too. Your images are beautiful. Will follow with my personal account. Thank you so much for your fast reply and explanation, dear Luise. And thank you for following me ?❤️?? In my blog’s IG account there were really old photos i added hashtags to 2-3 weeks ago and right at that moment I started getting likes on these photos. With this Instagram feature, why did this happen to me? I am very sure of it and even used this technique to gain likes in the next few days. Yes, that works, I tested it a few months ago. I’m virtually certain that all the likes (and comments) are coming from accounts that use automated engagement. If you’re not aware, there are tools you can set up to like or comment on posts with specific hashtags. I had the same users like virtually ALL the photos I tagged, and I tested it 6 times, even using the same tags on totally irrelevant photos. So yes, it will get you some additional likes, but they’re meaningless. Hey Louise thanks for your article. I wanted to ask your or anyone’s help please I’m going nuts lol. yesterday for the first time when i commented hashtags right away right after i posted my (food) pic, it didnt work (it usually always does). none of the hashtags are broken or banned. my photo doesn’t even come up under the location tag. my profile is on public, i tried unlinking then again relinking my account to my Facebook profile. i tried deleting the ig app, updating the software on my phone, re-downloading the ig app, deleting and repasting the tags on my pic, nothing works! even worse, when i tried commenting one of my old photos with a random tag, it didnt show up even when i scroll all the way down to recent posts where it should be. (I recently blocked a bunch of people on ig I’m not sure if my tagging ability was blocked because of that or what). PLEASE HELP. Oh no! Sorry to hear this. I’m hoping it clears up after 24 hours (or maybe a week). IG seems to be clamping down on any unusual activity. I would love to hear what happens! Praying for good news! Hello, I just recently noticed that there has been a change to being able to view hashtags. It seems they only show you about the last months worth of hashtags. For example, if you search for #propellertable it shows only 3 posts but says there are 41 posts. My post on agoagainvintage from last year does not show. I also have a book shop that I carefully hashtagged by title and author and none of them come up anymore even though they are very niche. I will have to repost my whole store if I want people to find me by searching “flowerpotecology” for example. Did they publish new changes recently? Thanks for letting me know of this, Christina. Not sure what’s going on. I just looked at a new hashtag with just under 200 posts, and the oldest one appearing was from June 2014. So they do still work. It could be a caching issue, as I have noticed those on IG. I wonder what would happen if you deleted the old hashtag and re-added it? Maybe after shutting the app, or even a hard shutdown of your phone? Not sure it would do anything, but maybe worth a try. First off, thanks for all the great info. Very helpful! Secondly, just want to confirm I understand correctly, your comment re: ‘hiding’ hashtags. This is for folks who may want their photo descriptions to appear ‘clean’ or uncluttered while at the same time, the hashtags are still there in the background, doing all their work to get more visibility for the IG user. Yes? Is the format above correct? hmmm….tried the above format and my hashtags were all listed out as part of my photo description…they were not ‘hidden’….unless the idea is that the hashtags will still appear to me, the IG account holder (and while I am logged in to my account), but maybe they don’t appear to others? Good catch – I need to add an image to explain the format, and it is for a comment. I just did a ‘test’ search on a particular hashtag. I then see various photos appear on my screen, all of which apparently tagged with that particular hashtag. I then noticed two photo thumbnails that had an IG user’s name imbedded in the bottom left corner of the photo, which made me think ‘gee, that’s a very clever way to immediately get your IG user name noticed among a sea of other users’ photos….no one even has to click on the image…they can readily see your name appear in the bottom left corner of the photo thumbnail’. However, upon further inspection of these two particular photos, it seems the photos may have been ‘reshared’ (or whatever the IG term is) by the business entity, and that it was another IG user who took the photo, and so the business entity wanted to give that IG user credit. At least, that’s what I think was going on there. Does that sound about right? There’s not an auto-label feature, but you can add your name (often referred to as a “watermark”) in any of numerous third-party apps that add text to photos. I have some hashtags in my Note ready to be copied. When I do so the post doesn’t get published!? Not sure of what you’re asking. My method is to copy the hashtags, make my Instagram post, then paste the hashtags into the first comment. If your comment isn’t publishing, you may have more than 30 hashtags. It’s also possible (but not likely) that you’re blocked from commenting. But as far as I know, Instagram will pop up a message if this is the case. I have been using this method for a while on my climbing/travel page, and I have recently noticed that if I reuse the same copy paste from notes, after a while I can’t use it anymore and my comment won’t post. Apparently you can’t post the same comment with the same hashtags multiple times. However, I’m not sure how it works exactly, because if I delete one it still won’t post, but if I delete around 10-15 and replace with new ones, it’s considered different. This is frustrating because I can’t use a lot of the hashtags that work for me often. Any experience with this? Wow, this is interesting. How often do you post to IG? I post about once a day and use almost the exact same set of tags – about 6 of them change out, but I use the same 24 or so constantly. Let me know how often you post, and I’ll try to find more info too. The hash-tags are not enough to get popular. You must work hard to get many followers. You also have to do fit content, timing, communicate with users and so on. But it is possible. Do not be afraid. Of course, there are many things you can do to build your presence. But I won’t use, recommend, or mention automated engagement apps. You’ll have to promote that elsewhere. Wow this post was really helpful. I happened upon your post because my hashtags stopped working for me. One day I was getting 75 or more likes, next day nothing. When I search for my post among the hashtags they are there, but for some reason the likes have greatly decreased. I’m using the same great images and captions, any ideas? The dropoff you described seems really strange, if you haven’t changed your posting at all. There’s been some drop due to the algorithm, but it shouldn’t be this huge unless something’s happened to upset it. If you’ve had people reporting you as a spammer, maybe YOU can see your post in the hashtag but IG is hiding it from others. Is it possible your account was hacked? I’ve had a lot of innocent-looking accounts posting spam lately. This is all I can think of, as I haven’t heard of a drop this severe before. I’ve never been able to get even a small list of #’s to post in comments. I always get a red exclamation mark . .. Any ideas as to why I can’t add hashtags in my comments? I’ve double checked the list to make sure sure that the hashtags aren’t repeated from the ones under the caption. Thanks! Hi Gail, I’ve never had this happen unless my comment would take the hashtag total to more than 30. Other than that, perhaps you’ve included a banned hashtag? You’d have to Google for a current list. Sorry, this is a new one to me! I’d love to know if it spontaneously clears up, meaning it was just a temporary ban of some sort. When I try to post hashtags as a comment on my post, it says “couldn’t post”. It offers a retry button, but that doesn’t yield any results. Have you heard of this? It has been happening for years, on both new and old IG accounts. Google hasn’t provided any solutions to this, nor reported it happening very often from what I can see. When I get the retry button, it’s because I’ve gone over 30 hashtags. If you’re using the same hashtag combo more than once a day, that could also trigger a block. Or, possible that you’ve got a banned hashtag or word in there. All pics he posted show in the feed but I have tried 11 posts using the same hashtag and mine do not show in the feed. 1, I’ve seen strange caching issues with hashtags, sometimes it takes a while for new posts to show up. When I search for that hashtag IG tells me there are 10 posts, but when I go to the hashtag feed, it tells me there are 0 public posts. Weird! 2, you have posted a lot in one day. That might trip an algorithm, IG suspects you might be a spammer. A new account needs to dial it back. Try one post a day and maybe the tags will work again. Thank you Louis for this beautiful read. I have finally found someone who says it’s okay to post 30 hashtags. I always found that was the best way to get engagement I tried to cut down a few times and saw a drop in engagement. It would be awesome if you could look at my page and give me your thoughts on my hashtag game! My ig is @forever.aesthetic . Thanks a lot hope to hear from you! Looks good, Michael! I don’t know your niche hashtags – just make sure you include a few around the million-uses mark to get more activity right after posting. I have an issue: I have 58k followers and all of a sudden, none of my posts show up in any of my #s. They have all been removed. My account is active (I am able to post) but if I post to a # and then search that # my posts are not there. (other users can post using my # and their photos show up, but mine don’t). I am so frustrated and can not figure it out! Any insight? thanks!! I’ve been hearing this recently but don’t know what’s up. Possibly a temporary glitch with IG. I have a big problem…I’m new on Instagram app! I open my account and linked with FB account, but I notice that my posts doesn’t show in hashtags that i use! I update the app, uninstall and reinstall but didn’t work! I’m not certain – just heard this from another user with a new account. Maybe IG has a temporary hashtag block on new accounts now, idk. I would say, post only once a day and be sure you don’t trigger any spam filters with your words, content, or activities. I hope the block is over soon! I’m on the same boat Kristijan! However, mine WERE working at first. I’ve been on Instagram for just over one day now. All my posts appeared on their hashtag pages until 14 hours ago. They’re not there anymore 🙁 so I’m not getting any new interaction besides from my followers. That’s what I’m hoping too. It’s very odd. IG doesn’t seem to respond any more. I’m sorry I can’t help. Hoping it resolves for everyone soon. I created a personal account with 9 posts in the same day, with different hashtags per post. The last 2 or 3 posts had a couple of similar hashtags though as I was starting to favour some, including one I created. Everything was working great until my 10th post the next day (as far as I knew). When I posted the 10th post, I noticed it didn’t appear in the hashtag pages I used for it. Then I noticed that ALL my previous posts weren’t in any of the hashtag pages they once were. Easy to notice when the hashtag page I made showed 0 posts and the ones that only had a few 100s didn’t show mine where it was chronologically just the day before. My question is did I get caught in an automated algorithm where Instagram thinks I’m spam? I kept reading you say “don’t post more than once s day”. And if yes, is that why ALL my posts got taken off their respective hashtag pages? I’d understand if it was just the new post not appearing. But ALL my posts?! I do also think something’s wrong with Instagram as I tried making a new account a couple of days before (even with a different email address) but my one single post didn’t appear on any of its hashtag pages so I deleted it. Thanks for the tips! What are your thoughts on Instagram punishing users for using too many hashtags? I am wondering if their algorithm would possibly be set up to do that since one day I posted without hashtags (accidentally) and had more likes than usual. We were just having a discussion about this in a FB group! Everyone agreed that they get way more engagement by using 30 hashtags. Is there any way you might have included a banned hashtag when you were using them? Or did you post at a different time? Not only are hashtags SO IMPORTANT on IG but it is just as important to research the right hashtags to target your intended audience. Nice post Louise… keep up the good work! Brilliant! Thanks so much Louise for posting this. Hashtags seem to be part of a complex new language and your post is really helping me understand it better. Just wanted to confirm one thing with you – are you saying not to add any hashtags in the description but add them all (using the . . . ) in a comment as if i am commenting on my own pic? or perhaps i can comment as another user…? I think it’s fine to add a few in the caption / description. Maybe 3 to 5. If you’re using hashtags of a million or more uses, that’s where I would put them, so they post right away. You can’t add hashtags to a post as another user. They won’t work. If you see people do this, often they are suggesting the original user add the tag themselves. Or they just don’t know! Where do you draw the line between popular, less popular and too small to bother on hashtags? Are you using the numbers of posts as your guide? #Realestate has 5 million posts and #realestateSacramento has 11 posts. Do you have any suggestions for the kind of volume that represents that sweet spot? Sorry for the delay. Just found this in spam folder. Try 5K to 50K as number of posts. See if you appear in Top Posts for those hashtags. If not, go lower. If you appear in all and stay there, try some higher-use hashtags. First off, I just want to say to others, I had the same problem, and it was glitch or something in the IG that prevented me to hashtag my photos. So you need to update your IG right now because its working. Mine is now working but there is a drop in the numbers. It may be due to people not knowing that the hashtags are not working and needs to be updated. Or that people are busy this time of the month, which is September. I hope this helps for all! And thank you Louise for this forum and your expertise! You’re welcome, Tiffany! Thanks for taking the time to share your experience.